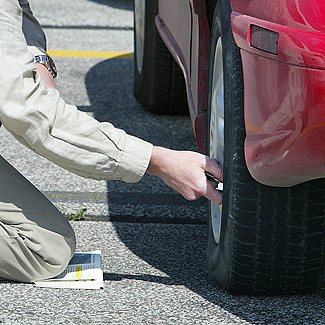 Check and inflate each vehicle’s tires to the recommended tire pressure rating, with air or nitrogen, as appropriate, at the time of performing any automotive maintenance or repair service. Indicate on the vehicle service invoice that a tire inflation service was completed and the tire pressure measurements after the service were performed. Perform the tire pressure service using a tire pressure gauge with a total permissible error no greater than + two (2) pounds per square inch (psi). Have access to a tire inflation reference that is current within three years of publication. Keep a copy of the service invoice for a minimum of three years, and make the vehicle service invoice available to the ARB, or its authorized representative upon request. The Tire Pressure Regulation was approved by OAL on August 30, 2010. The effective date for the regulation is September 1, 2010. FAQ-Frequently Asked Questions has been posted. OAL has until August 31, 2010 to make a determination. Please submit additional questions to Theresa Anderson at 916-445-2159. Please be advised that the resubmittal final rulemaking package for Under Inflated Vehicle Tires was filed with OAL today, July 20, 2010. OAL has until August 31, 2010 to make a determination. In addition ARB has requested for Early Effective Date of September 1, 2010. On March 22, 2010, OAL disapproved the regulations. Office of Administrative Law's (OAL) March 22, 2010, "Decision of Disapproval of Regulatory Action,"
OAL File No. 2010-0204-03 S (PDF - 486K). ARB has until July 20, 2010 to file a resubmittal package with the OAL. The Final Rulemaking Package was filed with OAL on February 4, 2010. OAL has until March 19, 2010 to make a determination. The Modified Regulatory Language for the Second 15-day Comment Period for Under Inflated Vehicle Tires has been posted. The deadline to submit public comment is January 29, 2010. The Modified Regulatory Language for 15-day Comment Period for Under Inflated Vehicle Tires has been posted. The deadline to submit public comment is November 9, 2009. News Release- Tire pressure check will save money, gas and lives . The Initial Statement of Reasons for Under Inflated Vehicle Tires has been posted. This item is scheduled for the March 26, 2009, Board Hearing. More information to follow. October 8, 2008 Workshop Presentation has been posted. October 8, 2008 Workshop Agenda has been posted. More information to follow. Please sign up for our monthly tire reminder program. Workshop Meeting rescheduled for October 8, 2008. For more information please view the Workshop Meeting Notice . Workshop Meeting Scheduled for September 10, 2008. Please View the Workshop Meeting Notice. More information to follow. All presentation from the June 4, 2008 Workgroup Meeting have been posted. June 4, 2008 Workgroup Meeting presentation is now available. Workgroup Meeting Scheduled for June 4, 2008. Please view the Workgroup Meeting Notice. More information to follow. Workgroup Meeting Presentation has now been posted. Workgroup Meeting Scheduled for March 18, 2008. More information to follow.